Load the weight of the world on your shoulders with the AR500 Armor® Atlas Adjustable Weight Plate Carrier. Designed to supplement your tactical and training by incorporating function towards multiple training regiments. You’ll find the Atlas equally comfortable and beneficial during Tactical, Endurance, Strength, and CrossFit training. Fully scalable in weight from 1.6 to 49.2 lb’s, you can fine-tune the Atlas to your desired level of resistance in minimal increments to increase or reduce intensity as needed. 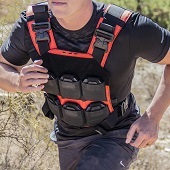 The Atlas shares many features of a traditional plate carrier, such as the form, but is heavily enhanced for comfort, durability, and ease of use in workout and training applications. This makes the Atlas weight vest/plate carrier an ideal training aid for professional or personal use. Applicable to EMS, Fire, Military, Police, and Civilians alike, the AR500 Armor® Atlas preserves your “go time” gear by reducing wear and tear on components you need to function properly when your life’s on the line. The Atlas accepts our specific ½” Military Grade Plating as weighted inserts. Each main plate pocket accepts the 10x12” 10lb and the 11” x 14” 15lb plates. To supplement the primary pockets the Atlas features 12 smaller utility plate pockets that accept our ½” miniature 1.6lb weight plates. These plates can be mixed and matched as desired to achieve any training weight up to 49.2. The Atlas Adjustable Weight Plate Carrier is constructed from genuine 1000D Cordura nylon for heavy abrasion resistance and durability. It’s rugged internal plate retention straps secure all weight plate sizes in the primary plate pocket. Snag-free exterior miniature weight plate elastic pockets and retention straps feature easy to grip Hypalon pull tabs. Uniquely designed extra wide backpack inspired shoulder pads are designed for maximum comfort even when fully loaded. The internal mesh lining, on both shoulders pads and inner plate carrier body facing sides wick moisture, reduce heat, and improve comfort. The Atlas is equipped with load bearing anchors for use in conjunction with Sleds, for Sled pulls. Functions in forwards, backwards, and side positions. Any appropriately rated load bearing carabiner and rope will suffice for pulling with the Atlas. Add to Pull Ups, Push Ups, Sled Pulls, Squads, Firearm Drills, Carry Drills, Pulling, Hiking, and so much more! Since I can’t return this item, I thought I would review it so others will know how this thing actually feels and fits. I bought this because I wanted a dedicated gym weight vest and I wanted more weight adjustment, which is why I also bought 12 of the 1.6 lb weights for the pouches on the front and back. First off, save your money and buy the cheaper variant without the cobra buckles. You are spending an extra $100 for PLASTIC cobra buckles which IMO is ridiculous. I haven’t tested the durability of these yet, but it’s definitely overpriced for what it is and it’s not stated on the website. For reference I am 6’1”, about 195 lbs. All of these comments are based on 2x 8.75 lb plates in the vest and nothing more. I adjusted the shoulder straps a significant amount to get tight enough and it left a lot of loose excess strap in front of me. There are some bands behind the front of the carrier you can slide the excess into, but it still moves around too much. So if you are smaller, you will have a lot of excess strap. Also you better make sure you get right the first time, it’s hard to adjust while it’s on unless someone is helping you since the strap pulls back, not forward. You need to take it off, adjust, roll up the excess strap and Velcro it down so it doesn’t loosen as you put it on, and then repeat until you get it right. The way the side straps are designed, it is almost impossible for me to put this carrier on by myself. The female end of the buckle is at the back of the plate carrier and you cannot loosen it, it is fixed. I had my gf help me almost every time. I could sometimes get this on by myself but basically you have to fully loosen the male end of the strap and then retighten it down. That would be all fine and dandy if the method of securing excess strap (so it doesn’t loosen during use) wasn’t folding it end over end and velcroing it down. You would have to do this every time. The straps not being elastic is also a severe design flaw for comfort. This carrier is meant for mobility. I run in my carriers, I am physically rigorous when I’m at the gym or outside in a vest. If I tighten it enough to comfortable, it bounced around way too much. Tighten it enough to stop from moving, and I can’t breathe. Add any of the 1.6 lb weights and it just exacerbated the issue. This also brings me to the mesh. It’s thin and provides almost no padding. I can feel the plate bouncing on my chest when I move around. I have a 5.11 TacTec plate carrier I spent less on that has better comfort, padding, and gaps that allow better airflow. I would highly recommend adding foam or something on the inside behind the plate.